Floor lamps are a great way to provide lighting to your home. If you’re looking to revamp an old floor lamp or you have one that is just not your taste of color, refurbish it to match your decorating style and fit your personality. If your lamp has a dingy or old shade, don’t throw it out. Refurbish the lampshade as well to save money and make it your own. Note: Before you begin refurbishing your floor lamp, make sure it is not plugged in and all light bulbs are removed. Old lamps collect dust and cobwebs. Before you begin refurbishing your floor lamp, remove the lampshade and set it aside. Then, clean the lamp frame thoroughly with a cleansing wipe or a solution of water and vinegar on a rag. Be careful not to get any water or moisture in the light socket. 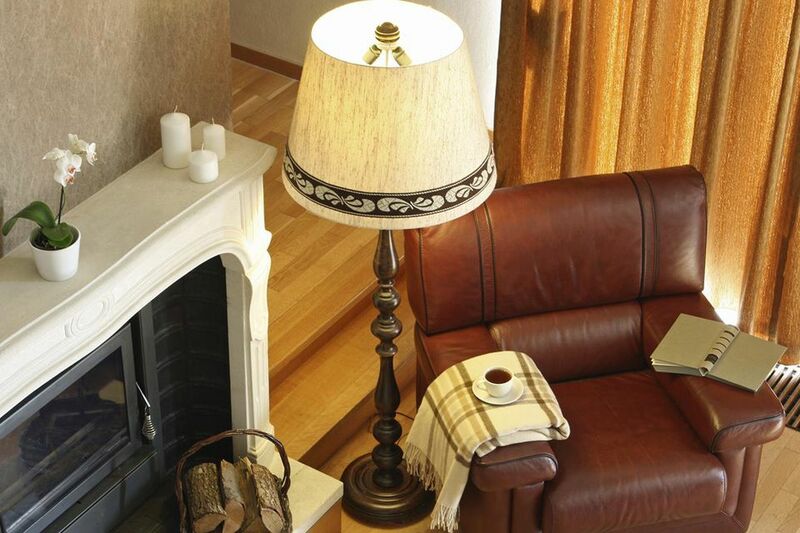 To clean the lampshade, wipe it down with a slightly damp rag to remove dust and cobwebs. If the shade is made of plastic, you can use the same water and vinegar solution you used on the lamp frame. If the shade is covered in fabric, use a vacuum to clean thoroughly. Cover any light sockets and power plugs with newspaper or painter’s tape. You do not want any paint to get in the mechanical parts of the lamp. Sand any wood or metal portions of the lamp frame to remove some of the old paint and prep the surface for the primer and paint. Tip: Wear a painter’s mask and goggles to prevent any of the sanding dust from getting into your nose, mouth, and eyes. Wipe off the frame to remove any of the sanding dust. After you sand the lamp frame, apply a primer and paint in multiple thin coats. Make sure you select the right kind of primer and paint for your lamp frame. If you are painting a wooden lamp frame, refer to How to Paint Wood for more detailed information. Apply any primer or paint in a well-ventilated area. Make sure you let the paint completely dry before putting everything back together. This can take anywhere from a couple of hours to overnight. Just make sure it is no longer sticky or tacky before bringing it back into your home. After all, the paint has dried, and your shade is ready for re-assembly, remove the painter's tape and newspaper covering the light sockets and power plug. Then, place the shades back on the lamp and screw in a new light bulb (or bulbs). Your floor lamp is now ready to display in your home.